This Everyman Mini clocks in at 8 pages, 1 page front cover, 1 page editorial, 2 pages of SRD, 1 page of advertisement, leaving us with 3 pages of content, so let’s take a look! Okay, we begin with two concisely-codified skill-uses to identify rules components of haunts via Knowledge (religion) and also, more relevant, unearth hints on how to end them. For settings like Kaidan or similar horror-themed games, this can be really neat! The latter is btw. reliant on a wide variety of skills, allowing all PCs to contribute to such attempts to identify. The pdf then provides a new bard archetype, the spirit singer, who replaces soothing performance, adding call spirit (not properly italicized) to spells known and may cast it by performing 10 minutes. The bard must spend 5 rounds of bardic performance, +1 round per round he concentrates on it. Ähhh…I think something went wrong here. 10 minutes with that cost…I think this ability was supposed to offer bardic performance-based call spirit as an additional option, but RAW, this is just confusing. 18th level’s versatile performance lets you call a spectre, at high-performance-per-round cost, but here, the rules are tighter. You also take temporary negative levels while maintaining this. Instead of distraction (which may be learned instead of versatile performance, starting at 10th level), the ghost singer may bypass mind-affecting effect immunity of incorporeal undead with performances and bard spells. The archetype also begins play with speak with dead/haunts, which upgrades at 6th level, replacing versatile performance gained there. We also get a new thematically-fitting bardic masterpiece, the Lullaby of Calming Spirits, which allows the bard to lull haunts into an inactive state – cool! We also get 3 new investigator talents. Phantom inkling enhances initiative versus haunts and allows the investigator to notice haunts. Using inspiration dice to make attacks as though ghost touch is nice. Spirit Sleuth’s header is not properly bolded and makes use of the new skill uses noted. The pdf also offers a level 2 burn 1 substance infusion for earth, the ghost-blight infusion, which makes the kinetic blast target incorporeal undead for full damage, courtesy of salts. Spectral barrier is a level 6 aether utility wild talent that duplicates anti-incorporeal shell, with 2 burn as an option to make it last for class level rounds. The pdf also includes 4 magic items: Corpse glass can be directed at a place where an incorporeal undead was defeated, showing the remains and distance etc. – neat. Ghost-snarl bags are incorporeal-only tanglefoot bags. PEACHWOOD SWORD (oddly, allcaps) are problematic: These wooden swords cause Cha-damage on crits versus undead, and when destroyed from such a sword, rejuvenation etc. are ignored – the undead is destroyed. This wrecks many a great narrative and rewards critical-fishing builds. It can also target possessed creatures with cast out. Not a fan. Phantom snare, finally, is basically a ghost trap. Editing and formatting are still good, but not as precise as usual for Everyman gaming, with the archetype sporting a rules-hiccup, for example. Layout adheres to a two-column b/w-standard and the pdf has no bookmarks, but needs none. The full-color artwork is nice. 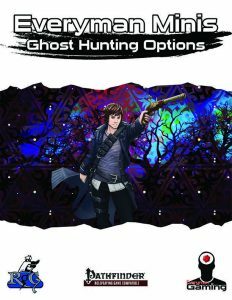 I really like the new skill uses in Matt Morris’ ghost hunting mini, and some of the items are pretty neat. At the same time, the archetype takes up a lot of real estate and its concept has been done before in better, more interesting ways. The items, with the exception of the sword, are pretty nice. Still, as a whole, I was less blown away by this one than usual for both the author and the Everyman Mini-series. This is a solid, nice pdf and the skill-uses warrant getting this for horror-themed campaigns. My final verdict will clock in at 3.5 stars, rounded up for the purpose of this platform.